Working at Stringers London for one week was for me the first experience of working in a big shop, very different from what I was used to with workshops run by only one or two luthiers. I learned a new technique of edge restoration developed by Colin Cross and Sarah Beaton, the two restorers I worked with. 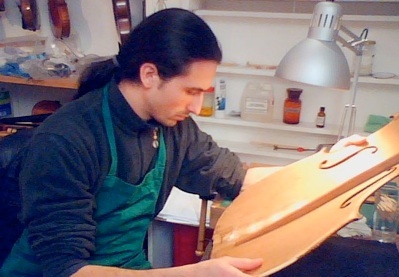 This technique, I think, reflects well the challenges modern restorers have to deal with: conservation of the original wood of the instrument, strength and durability, as well as invisibility of the restoration. 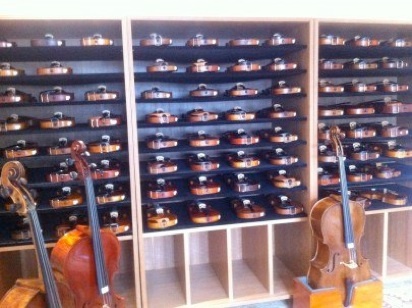 I also had the opportunity to see some instruments at Tarisio for valuation. I learned also about soundpost adjustments and how tricky it is when you have to do it in front of the musician. A few weeks after my work experience, I was offered a job as luthier at Stringers London. 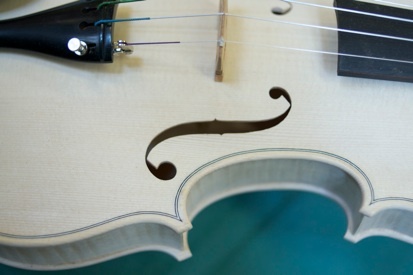 The pictures show one of the violins that Etienne made during his studies at Newark, the room at Tarisio where he spent time with Colin Cross valuing instruments, and Etienne working on a cello restoration.